A couple of weeks ago, I had what I thought would never happen, an actual wedding in Korea. Now, just in case you are confused, I have already been married for over three years, but as I explained in a previous post, this was a British Consulate job. The reason for it was I was in love and desperate to be with my now wife, despite the fact I was leaving Korea and going home to England. At the time, I was having such a terrible time in Korea that I thought I may not return, but I could not bear the thought of leaving without her. I knew that my wife's parents wanted to organise a proper wedding. Many of their relatives did not know we were married and my in-laws also did not want to tell them because the way we got married was so unusual. However, I thought it highly unlikely we would have a more official ceremony because they did not have enough money and I was saving to put my wife through nursing college in Australia. I told them - in a typically Korean indirect manner, (not quite like this) "I will happily have a wedding, but you will have to pay for it." Much to my surprise, they were able to pay and the great thing about Korean weddings is that you get most of the money you spent on it back through the guests that you invite anyway, as they all give some money. They hadn't broken the bank after all, so my conscience was clear as well. It all seemed perfect then, didn't it? I was getting a wedding day and I wasn't paying a penny or indeed organising anything! Perfect! The only thing was that both my wife and I were not really looking forward to it. The reason for this is that we had both been present a quite a few other Korean weddings and, with the exception of one (my Australian friend's rather unique and interesting traditional service) we had hated every single one of them, or should I say hated the thought of our day being like it (I rather enjoyed the food at each occasion). My friend's wedding, a couple of months before mine, was very traditional and it really suited his character. I could have never pulled it off, but he really did and it was a great day. Let's start with the venues; the wedding halls that Korean people typically get married in are, to me, the least tasteful places imaginable; flashing lights, stupid themes, and embarrassing performances littered many of the ceremonies I have witnessed. There is a cringeworthy feeling about the whole thing and a cheapness and lack of class about it all. This was the first fear for my own wedding, especially as I was sure my in-laws would be trying to do it all as cheaply as possible. Secondly - partly caused by the venue itself - I hated the atmosphere created by the organisation of the ceremony itself and the manners of the guests. Wedding Hall marriages seemed to resemble a food hall, with people wondering in and out of the ceremony as they pleased and those from the next wedding waiting in line behind them. Doors to the back of the room where the service took place would be wide-open; people talked through the readings and the vows and babies cried at the back of the room. Fear number two for my own wedding, and I could imagine my head exploding at the thought of crying children and nattering old ladies spoiling our big moment. Lastly, most of the weddings I had attended as a guest had a very anti-climatic feel about them and a complete lack of romance or magic. The services ended quickly and even though they were fast many people would not stay and hastily embarked for the food before the end. Unlike an English wedding, there was no big party afterwards, no dance between bride and groom, no drunken antics, and none of the majesty and tradition an old English manor or church can convey. Korean weddings lacked that special something, that x-factor I had seen in most weddings in England. English weddings were beautiful, Korean weddings were like a factory line of benign similarity, cliche themes, and too much haste. For all these reasons and more, I was not that optimistic about how my own wedding would pan out. However, in what turned out to be one of the most pleasant surprises - perhaps of my life - it turned out to be an absolutely perfect day; one that suited my wife and I in almost every way possible and on a number of levels. You see, the human mind is a strange thing, it yearns for the approval from others and to show-off - a couple of things I have always hated about the concept of getting married - over and above actual happiness, much of the time. Essentially, most weddings are a big, expensive showing-off exercise that has bankrupted many right at the beginning of their married life. For one day of extravagance, many people pay the price of an increased financial burden, sometimes for the rest of their married life. It actually stresses the most important aspect of it all, i.e. the marriage and the relationship itself. I'm not even going to talk about those who divorce and marry again, incurring even more expense for another marriage. This was the first burden that was off my shoulders; the whole thing cost us nothing. In fact, we actually made a few hundred pounds out of it, amazing! Sounds shallow and money-grabbing, I know, but one can't deny the relief of it and the weight it took off my shoulders. Added to this was absolutely zero stress in organising anything for yours truly. A couple of months before the wedding, in about the only thing I had a hand in doing, I went to a couple of wedding halls with my in-laws, and after one truly awful place I was delighted to find quite a quiet, less flamboyant, but classy wedding hall on the outskirts of our town. My wife's parents weren't that happy about it because the ease of getting there was not quite as good as the other one for all their relatives. With this in mind, my wife nudged me to make a real fuss about how much nicer this place was (which it really was) to make sure they caved-in to our wishes, so I put on an oscar-winning performance to win them round. 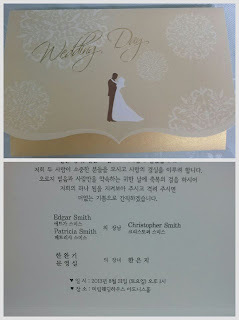 I am glad I did, because I still have not been to any other wedding place in Korea that looked so nice. Worry number one about the service negated. Once we had selected the venue, we were taken inside to agree what we wanted for the package, which included a photo shoot. 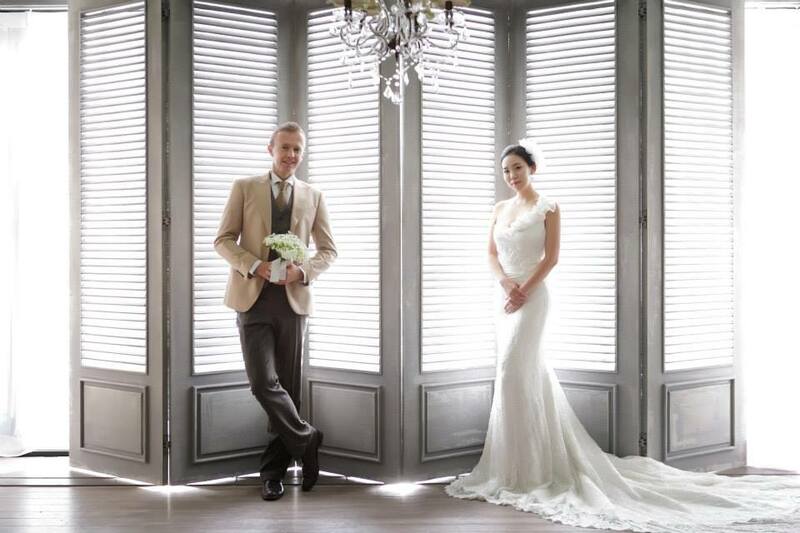 The wedding photo shoot is what almost everyone does in Korea a few weeks before the wedding and is professionally done in a proper studio. I had seen the photo albums of this at other weddings and I must admit it was one of the few things that I was impressed with about weddings in Korea. It seemed a nice touch and was something that would remind us of how we were when we were married - and in our physical prime - in years to come. I had been warned about the shoot itself from my Australian friend, Darren, who got married a couple of months before. He said it was about seven hours of posing, sweating, and boredom and he feared for my sanity. I must say that I have a debt to pay him for telling me about it because, mentally prepared for what was to come, I came through the whole experience in pretty good spirits. In fact, it was my wife who looked more frustrated with it all, probably because she had more dress changes and attention given to her and her poses had to be more elaborate than mine. I might be bias, but my wife looked absolutely stunning in all the pictures. The studio were fantastic and also very efficient in getting the huge number of photos taken back to us on e-mail so we could choose the best for the album and for some photo frames. I was very impressed with the pictures and was very glad we had it done. All I had to put up with was a little mickey-taking from back home when some of mates saw the odd photo leaked onto facebook by my wife. But my wife and I looked great, so I didn't care. Next week in part 2, the wedding day itself. 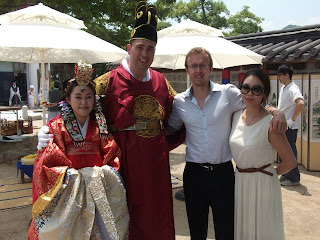 The pictures included some taken in Hanbok as well. Thanks, I knew I wasn't being bias, just proves I am always objective on this blog :). Just out of curiosity, do you ever worry about your wife parents find out what you have to say / what you truly feel about them on this blog? such as you put on an Oscar performance when it comes to the wedding venue they have picked for your wedding? I mean, surely there are younger members of your wife's family who understand enough English and might come across this blog by accident? You would think there would be younger members of the family who understand English, but actually, no there aren't and what's more there is no one in the whole family with any aspirations to learn English either. But anyway, I don't think it would be the worst thing in the world if my in-laws happened across my blog and understood it and I don't think anything major would happen. As long as I don't directly confront or disobey my in-laws I don't think there is a problem. I don't think I am too scathing on this blog about them and I continue to write nice things about them along with the negatives. The negatives are all cultural as well and is not a slight on them personally because I know they are very genuine and nice people. If they did read my blog, they might even understand me a bit better. However, I can't imagine that will ever happen. We attempt to make your marriage an event to be remembered. We offer custom designed themes according to your decor style, color theme, & venue. All of this is done in your color theme, in your choice of material & size requirements. Yikes. 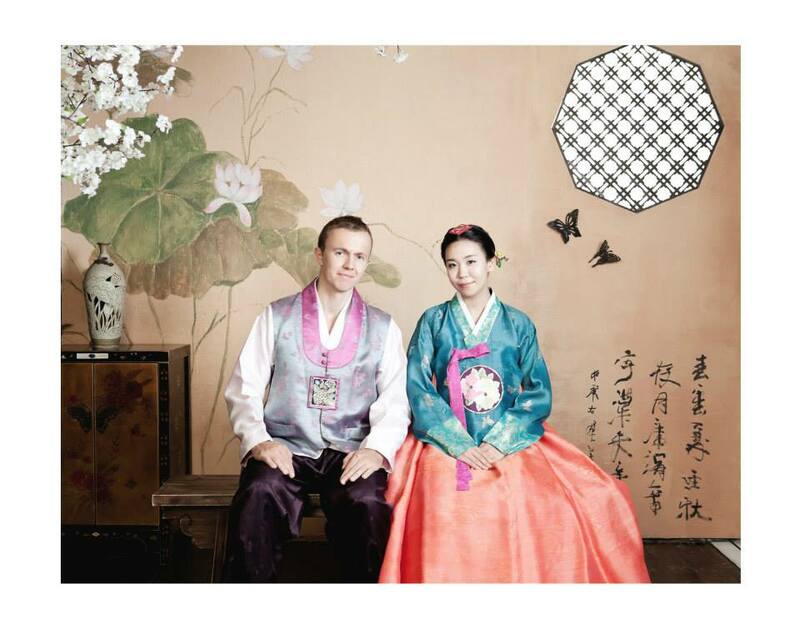 Some of the comments about korean weddings lacking class comes off a little culturally insensitive. You really seem genuine in your observations and I don't sense maliciousness, but you come off as a bit of a snob to other cultures and what is deemed the norm in other countries. It's not like there aren't tacky aspects about every culture and country, but it depends a lot of who's the observer too. I don't want to leave this comment here to attack you, but as a reader on your public blog, I'm going to assume you are open to some amount of feedback from the great wide web. In short, a lack of grace in the face of diversity and unfamiliarity can also be a bit "tacky" and "classless". I don't really care about being culturally insensitive if the truth is what it is. The traditional ceremonies in Korea are not tacky or tasteless, but are really nice, but the 'White Wedding' part is very often odd to say the least. It's not really a case of me being a non-Korean or unfamiliar, I know plenty of Koreans who think the same and my wife was particularly worried about our wedding coming over a bit tacky also based on the other Korean wedding hall weddings she had seen. 'Diversity' is one of these words that bothers me, as just uttering it means that everyone must think it is a good thing. Well, Britain's high street culture of drinking on a Friday and Saturday night could well be considered an example of diversity in culture (it's different for sure), so if you're non-British, by your argument, you should appreciate it and not judge all the drunken fighting, passed-out people vomiting, getting in trouble with the police, and going to the hospital to get their stomachs pumped and using up hospitals beds in A&E at the taxpayers expense. In this much more serious example, the behaviour is morally wrong, wherever you come from, visitor or not. You see the argument doesn't work when you turn things around; this is my opinion about one specific aspect of Korean culture as I see it, i.e. weddings (and a particular part of the wedding). Why should it matter where I'm from? I understand what you say, however, and appreciate feedback and criticism. I find tact can be another word for not being honest about what you think and can be counter-productive in dealing with other cultures if you are not careful, honesty has always been preferable to me. When it comes to good and bad practices and cultural thinking and norms, I try to treat Korea exactly the same as my own country. I give my honest opinion based on what I see, simple. I have been impressed with your message. Great view! your content was very pleasant and interesting to readers. Thank you very much for posting this.Keep up with good work. Wedding hall are well planned and especially designed for hosting grand weddings.They include large ballrooms and well designed private bridal suites. Wedding Garden is a premier occasion design palace that offers styling and wedding decoration services, including flowers preparations specialty linens, hire equipment. Marriage halls style attraction is additional combination, and less traditional to cater to today’s generation of newlyweds. Banquet halls provide a huge collection of decoration as well as full Mandaps decorations, flowers design, beautiful long curtains, furniture for guests, stage decoration for bride and groom and other accessories for attraction the guests. I have read your blog this is very nice to read you also read our blog please contact :- original and fresh by the place of better banquet hall vaughan means. The article is helpful in completing the work banquet hall noble as well decent means. The article is good enough and helpful for the cause. Wonderful event! It seems like you guys had loads of fun over there. I have been to Korea several times but never attended such a Korean party. 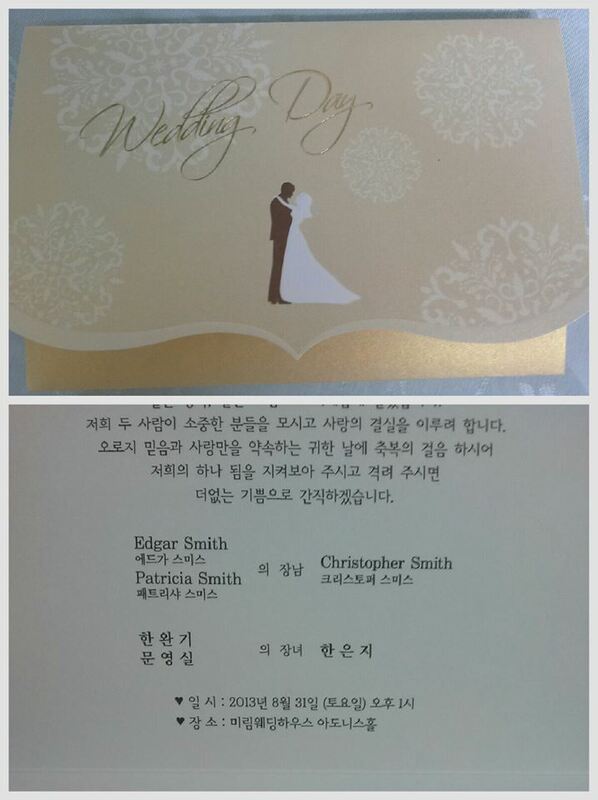 We are going to attend a Korean wedding at one of Chicago wedding venues. Have high expectations from it! Best Wishes! May your love deepen and your happiness propagates with each passing year of your marriage life!